These are beautifully designed men's eyeglasses for those men who want to make a statement and stand out from the crowd. The medium bridge guarantees a comfortable fit for the average face, bringing more of an overall balance to your face. Durability should always be one of your priorities when you look for new eyewear, which is why these plastic eyeglasses' Ray Ban RX5169 frames are ideal. If you're the active and practical type, you'll benefit from having plastic frames. If you've been blessed with a high bridge, you won't need nose pads to keep your glasses in place, meaning you can position them you like. 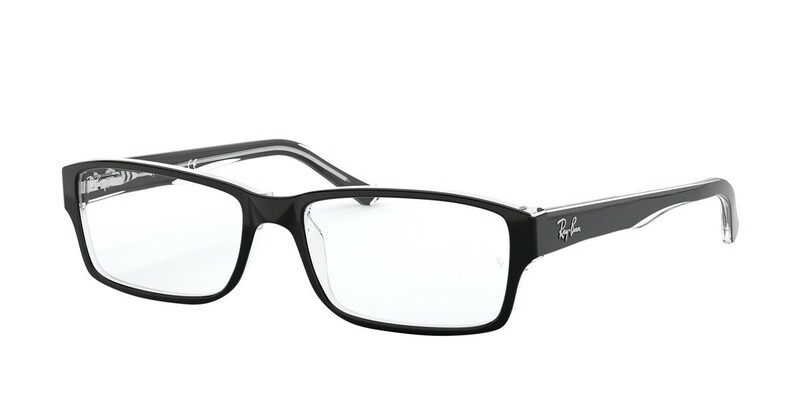 These full rim Ray Ban RX5169 eyeglasses are perfect for the college student. Transform your look and go from geek to hipster in a matter of seconds depending on where you are, whom you're with, and what you're wearing. These rectangular shaped glasses are ideal for people who want to add a look of seriousness to their everyday image. If you've got an oval-shaped or rounder face, these glasses are highly recommended as they help bring more of a balance to your face. High fashion is hard to keep up with, but you'll be moving in the right direction with these cool eyeglasses that epitomize style and cool. Stay ahead of the game, because these are Ray Ban RX5169 eyeglasses that are taking you places. Comfort is key when choosing the right pair of glasses for you. For maximum comfort, opt for a pair of glasses with high temples that conveniently hook over the ears for extra security. Distance lenses - helps to see details at a distance. On your prescription, under the "sphere" column it usually appears with (-) next to the numbers. Near lenses - helps to see details at close distance. On your prescription, under the "sphere" column it usually appears with (+) next to the numbers. Lens for reading. No prescription needed. These lenses are Single Vision, Non-prescription, Polycarbonate with Anti-Reflective and Scratch Coating for reading magnification purpose. These lenses are Non-prescription (Plano), usually used for fashion purpose. This Premium Polycarbonate lenses also features Anti-Reflective and Scratch Coatings. II searched all over the Web looking @ these frames and NOBODY came close to the price I got here. Shipping was super fast also. I will be shopping here for all my glasses. Teenage son is very happy with these glasses, getting lots of compliments, looks very grown-up. Will always use this website to purchase whenever needed and will highly recommend. Company is very professional with great communication. Ordered them with Transitions lenses and I couldn't be happier with the price, selection and service. Tried on this pair at lenscrafters but the price was more than I liked. Found the exact same pair online for half the price. Even though they were backordered, they arrived very quickly. I'm very pleased with my purchase. Everything was great. Even thought these were on b/o for 2 weeks, they arrived 1.5 weeks earlier than expected. The only complaint I have is that the glasses were dirty when I got them. No scratches, just looks like debris and dirt was all over it. I had to clean it off (probably from the glass production and installation. If they cleaned them up before they shipped, it would have made for a better presentation. GlassesOnWeb.com was established in 2004 and provide best quality service to our clients. We are proud to offer competitive prices and wide selection of top designer eyewear products. GlassesOnWeb.com stand behind the quality of our customer support. PD or Pupil Distance is the distance between the pupil of each eye. Usually it is not provided by your optometrist and taken by the optician when you place order for eyeglasses. We highly recommend that you get this PD value when you have your eye examination. This value is measured in mm (MILLIMETER) which is used to align the center of the lenses with the pupil. You may ask your or any local optician/optometrist to measure your PD and send it by return e-mail or call us with it. Indicates the strength of your prescription. Distance prescriptions usually have a (-) before the number. Reading prescriptions will usually have a (+) before the number. Below (marked in blue) is where you should find the Sphere details.